Since this is a self-funded and self-published project, taking pre-orders is the most accurate way for me to gauge the number of copies that I need to order. I have to order a minimum of 250, but after that I’m uncertain on the interest and needs of this hardback print run. I’m excited! This is the fun part. I worked on and off for 7+ years to bring this book to you, I can’t wait to share it! Special First Edition: Hardcover with a protective dust jacket. Shipping: FREE. Pick up your book at the Launch Party or Missouri Book Tour and I’ll sign it. Or, receive by mail by November 1. Online: Visit my online store and place your pre-order. This worked well for about 95% of people last time, if you have problems please contact me. Mail: Make a check payable to Sierra Shea and mail to P.O. Box 93, Lake Preston, SD 57249. This will be the very first day that the book is available to the public! I’m happy to sign copies of the books and visit with you. I’ll be at the store to sign and hand deliver your pre-order books. Purchase a book and receive 10% off your purchases at the western store that day. Enter to win a pair of tickets for the Luke Bryan concert October 14th in Centralia, Mo. If you can’t attend the launch party, your pre-order book will be shipped around November 1, 2016. Check back soon for 1-2 more potential tour dates between October 8th – October 15th. If there’s any interest or need, I’ll consider adding a South Dakota tour stop upon our return. If you cannot pick up your pre-order copy of the second book at the Launch Party or Missouri Book Tour, I will take it back to South Dakota with me and have it shipped to you around November 1, 2016. Thanks for reading & sharing my work! My first goal for this book is to sell enough pre-orders to meet the hardback minimum order set fourth by the printers of 250. I love books so much, that I want this to be a nice, high-quality project. I would actually make more money (and have almost no need for pre-orders) if this book was printed simply as a paperback. But, I want to do it right this first time while I have the opportunity! 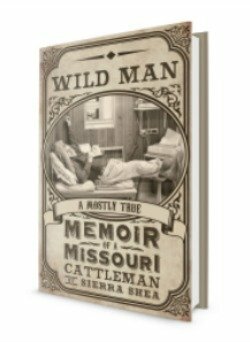 So far, I’ve been able to sell over 500 copies of the Wild Man book. These books about rural folks and farming make a great gift for that one hard-to-shop-for-person on your list who doesn’t need another wrench set or crock pot!